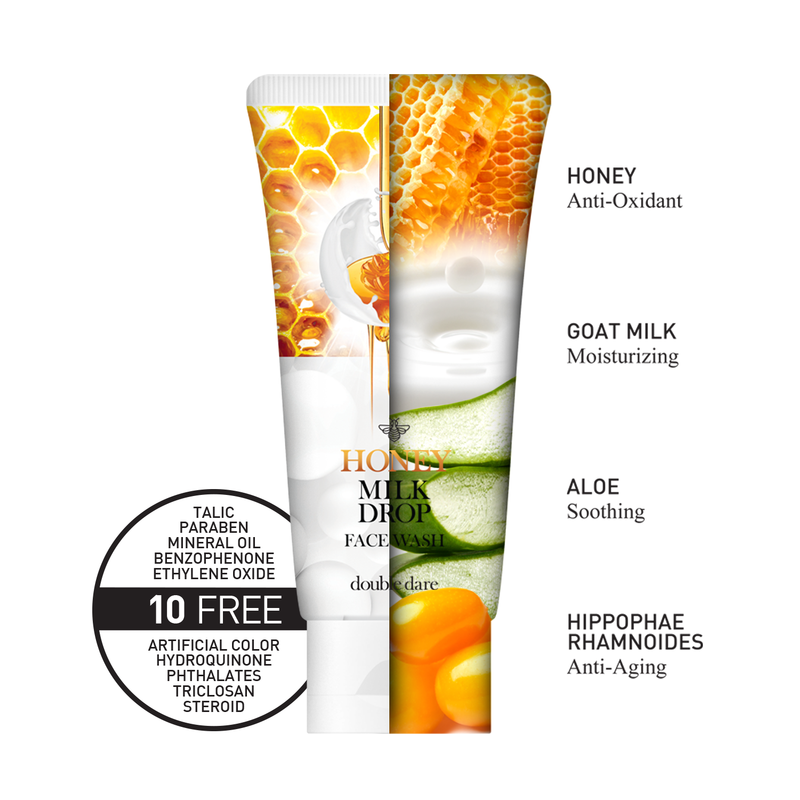 Honey Milk Drop Face Wash is an oil-to-foam milky cleanser that gently and effectively cleanses your face without stripping essential moisture from the skin. Naturally-derived ingredients, including honey, hydrate and soothe to help create a glow while milk delivers a gentle exfoliation effect to minimize sebum production. Massage onto skin. Rinse off thoroughly with water. Water (EAU), Glycerin, Sodium Laureth Sulfate, Potassium Cocoyl Glycinate, Disodium Cocoamphodiacetate, Sucrose, Acrylates Copolymer, Butylene Glycol, Sodium Lauryl Sulfate, Zea Mays (Corn) Starch, Betaine, Honey Extract (1,000 ppm), Goat Milk Extract (1,000 ppm), Eclipta Prostrata Extract, Aloe Barbadensis Leaf Extract, Melia Azadirachta Leaf Extract, Silk Extract, Moringa Oleifera Seed Oil, Hippophae Rhamnoides Oil, Butyrospermum Parkii (Shea) Butter, Elaeis Guineensis (Palm) Oil, Cocos Nucifera (Coconut) Oil, Theobroma Cacao (Cocoa) Shell Powder, Microcrystalline Cellulose, Mannitol, Lactose, Citric Acid, Sodium Carbonate, Sodium Chloride, Sodium Hydroxide, Tocopheryl Acetate, 1,2-Hexanediol, Phenoxyethanol, Fragrance (Parfum).